UC Davis Medical Center is a progressive, state-of-the-art health-care provider that proudly offers one of the most extensive and experienced surgical practices in California. Noted for research-based, multidisciplinary surgical approaches, UC Davis is a leading referral center for many of the region’s most challenging adult and pediatric cases. Dedicated to quality care and patient safety, UC Davis surgeons manage more than 20,000 cases a year using the latest technology, innovative techniques and tools to achieve great outcomes. Among the university’s many distinctions are its surgical Centers of Excellence in bariatric, burn, trauma, skull-base surgery and radiosurgery — the latter being a high-tech way to treat brain tumors without scalpels or sutures. Surgical expertise at UC Davis also includes the latest in minimally-invasive and robotic-assisted procedures. 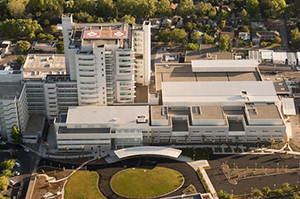 Patients and referring physicians have access to the broadest possible range of experts and treatment at UC Davis Medical Center in Sacramento, ensuring the best choice for individual needs based on the most up-to-date therapies available. UC Davis ranks among the nation’s top medical schools and is a regional resource for training surgeons, nurses and other health-care professionals. At the UC Davis Center for Virtual Care, sophisticated simulation training tools create a virtual hospital that is ideal for practicing surgical procedures, including minimally invasive techniques such as laparoscopy and robotic-assisted surgery. 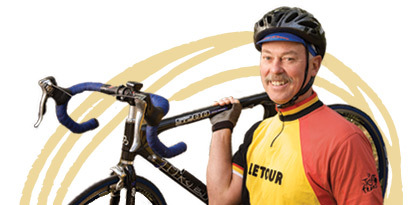 Leading edge robotic-assisted surgery at UC Davis returned Mike Stevens to cycling within a few short months of his prostate cancer surgery.